Enjoy the amazing taste of our Roasted Root Vegetable Soup today. 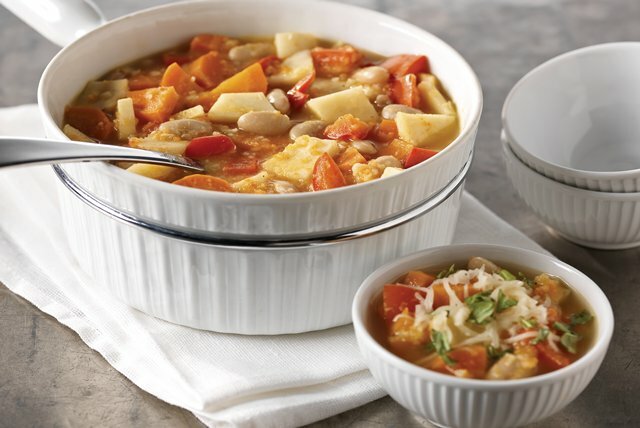 Our Roasted Root Vegetable Soup is easier than it looks and includes yummy beans. Spread vegetables onto bottom of 15x10x1-inch pan. Drizzle with dressing; toss to evenly coat vegetables. Bake 40 to 45 min. or until tender, stirring after 20 min. Add 1/2 cup broth and 1-1/2 cups vegetables to blender; blend until smooth. Pour into large saucepan. Add remaining broth, remaining vegetables, beans and black pepper. Bring to boil on high heat; simmer on medium-low heat 10 min., stirring occasionally. Serve topped with cheese and basil. A cream-colored root vegetable in the carrot family, parsnips have a delicate, slightly sweet, nutty flavor. Loaded with vegetables, this flavorful low-fat soup is an excellent source of fiber from the combination of beans and vegetables. And as a bonus, it's rich in vitamin A from the combination of carrots and sweet potatoes and a good source of both calcium from the cheese and iron from the beans.